There are many kinds and types of retaining walls, ranging from decorative garden walls to engineered retaining walls. You can even opt for a wood retaining wall. 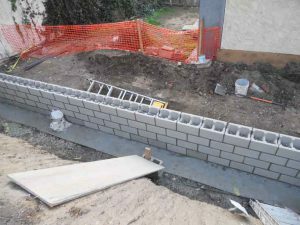 Retaining walls are commonly designed for various purposes including soil containment (to prevent the soil’s down-slope movement and soil erosion), creation of flat, usable areas and living spaces and construction of basements. Retaining walls are constructed with reinforced concrete block or cast concrete or Shotcrete. 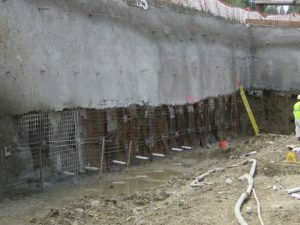 A concrete block retaining wall is constructed by using hollow core CMUs (Concrete Masonry Units) reinforced with steel and then filled with concrete. This type of retaining wall is built according to the dimensions specified in the construction plan. 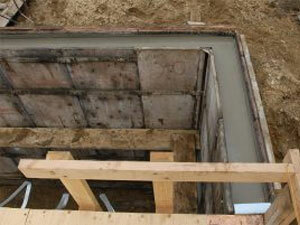 It is properly reinforced with steel and filled with concrete. Poured-in-place retaining walls could be poured plain / smooth-faced or with a variety of designs such as brick for aesthetic purposes.